Kokořín Castle lies in the middle of a nature reserve on a steep rocky spur above the Kokořín Valley, north of the village of the same name. Originally, a medieval fortress carved in the local sandstone was built there in the days of the King Jan Lucemburský. The first recorded mention of Kokořín dates from 1320. In the same year Sir Jindřich of Osměchov recieved Kokořín manor from the nobleman Hynek Berka of Dubá who – some time in the middle of 14th century - had the original castle built. During the following centuries many prominent noble families owned Kokořín Castle for brief periods. These include, in the 15th century, the well-known warlord Jan Řitka of Bezdědice, Sir Aleš Škopek of Dubá who owned the castle during the Hussite wars, the lords of Klinštejn, Beřkov of Šebířov, Kuplíř, and Hrzán of Harasov gained control in the first part of the 16th century. Eventually, the castle ended up back in the hands of the noblemen of Berka. After the battle on Bílá Hora the possessions of the Berka family were confiscated and bought by the Wallenstein dynasty. After the death of Albrecht von Wallenstein the Kokořín castle was placed in the possesion of the king. By the 16the century the castle failed to meet the demands of the current living standards and had fallen into disrepair. 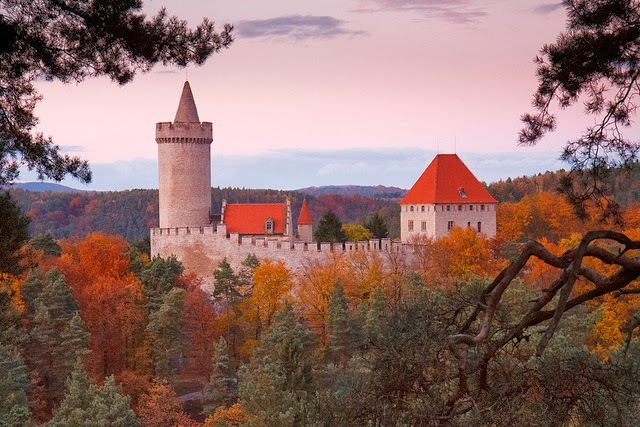 After the Thirty Years War, Emperor Ferdinand III even ordered the castle to be ranked among the so-called "cursed" castles – ones that might no longer be maintained. The castle deteriorated rapidly and in following years it was owned in turn by a whole series of landlords. According to legend, the castle even came under control of robber barons, including Petrovský of Petrovice who spread fear throughout the region. By the end of the 19th century only ruins remained of the castle which, however, increasingly attracted the attention of a whole generation of poets and painters from the romantic period, e.g. K. H. Mácha, Josef Mánes and others. The castle entered into the general public’s awareness in 1895, when a model of its ruins was displayed by the Club of Czech Tourists at a national ethnographic exhibition in Prague causing the castle to be partially open for tourists. In the same year, the Kokořín manor, including the castle ruins, were purchased by Václav Špaček, a aristocrat from Starburg. He allocated a considerable amount of his finances to start complete reconstruction in 1911. Participants in the project for this imposing reconstruction were leading historians of the time (A. Sedláček, Z. Winter and Č. Zíbrt). The reconstruction was finished in 1918 by Václav´s son Jan Špaček who enhansed the original conception from cultural-patriotic dedication to the role of family memorial. Despite some objections to the style of reconstruction, based on the spirit of Late Romanticism, the project represented the first complete preservation of a medieval ruin in Czechia and its recovery by the public. After 1950, based on the agrarian reform laws, the castle was nationalized by the communist government. As late as in 2006, the castle was restituted to the hands of the Špaček family heirs. They intend to reassume the family tradition and keep this popular historical monument open to the public.